While we love to do many things with our iOS devices, the feature that often tops my list is taking and sharing photographs. In an age when we’re taking in new experiences faster than we can blog or tweet about them, snapping a quick image on the go can be just the thing to help us remember a good day on the beach. Apple’s iOS 8 packs in a ton of new photo-taking and editing features for its photography-loving user base, all the while keeping it easy for beginning iOS shutterbugs. There’s a lot to look at here, so let’s start with something simple: the Camera app. Also new to the Camera (and continuing the “Time” theme) is Time-lapse mode, found by swiping all the way to the right on the app’s display. Unlike other timelapse apps, Apple’s version is entirely automated; just tap the record button and the app will automatically take a still picture every few seconds. When you’re finished, it stitches those pictures together to form a time-lapse video. If you’re the lucky owner of an iPad Air or iPad mini with Retina display, you’ll also be able to use the Camera app now to take panoramic images; previously, the Panorama feature was limited to iPhone users. When you tap to focus, there's now a separate slider for adjusting a photo's exposure. 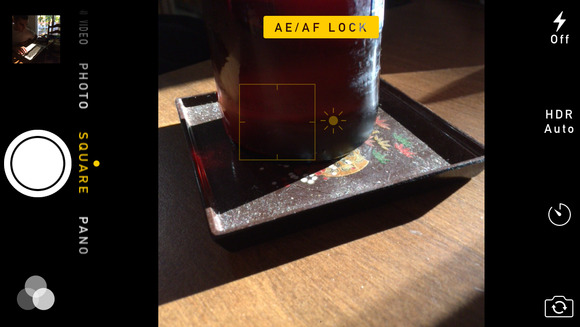 iOS 8’s new manual camera controls may be my favorite improvement to the app, however. In iOS 7, tap-to-focus and exposure lock were a single control; with this update, they’ve been split. You can still tap to grab focus (or long-tap to lock it), but now you can additionally adjust the camera’s exposure by dragging up or down on the sun slider that appears. This lets you grab a focus point without being forced to also use its lighting as your photo’s exposure. Apple’s automatic smart albums continue to provide some use in the Photos app: The Camera Roll has disappeared, and in its place is the Recently Added smart album, which collects images you’ve recently taken or added to your device. It joins app-specific and content-specific albums on the Albums page, along with the new Favorites album (more below). Sadly, Apple continues to decline to make a Screenshots smart album (to my own personal disappointment). MEET YOUR FAVORITES: Having all those images at hand might make you nervous about ever finding anything again. Apple has anticipated your concern, though, by adding both a smart search feature and a Favorites section. The search field will initially prompt you with a collection of nearby photos, images taken at the same time last year (for nostalgia factor), and all-time favorites; but you can also search by date or time, location, or album name. Under every picture in your library is a small heart outline; tap the heart to fill it and add the image to your Favorites album. You’ll be able to access that album on any iOS 8 device (or, in 2015, on your Mac), and any edits you make to those images that automatically sync. HIDDEN IMAGES: Sometimes, we take photos we don’t necessarily want to keep in full view. iOS 8 allows you to hide those unwanted images from the Moments, Collections, and Years sections of the Photos app, though they’ll still appear in albums. To hide an image, just tap and hold on its thumbnail, then tap Hide; it then vanishes, relocating to the Hidden smart album. To recover the photo, just visit the Hidden album and tap and hold the thumbnail to unhide. Hidden images can be found in their own special album. UNDELETE: Unlike past versions of iOS, when you delete an image in iOS 8, it’s not immediately removed from your device. Instead, it retreats to the new Recently Deleted album for 30 days, at which point it’s expunged from your device. If you've deleted an image and thought better of it, you can go to the Recently Deleted album and tap the image to bring up the Recover button. This is primarily to prevent you from accidentally deleting that perfect picture when you’re weeding out duplicates and blurry images, but it’s also a nice way to temporarily remove images you’re not sure you want to keep. You can dump this entire folder quickly by going to the Recently Deleted album, tapping Select, then tapping the Delete All button. Having all your images at hand might make you nervous about ever finding anything again. Apple has anticipated your concern, though, by adding a smart search feature to the app. The search field will initially prompt you with a collection of nearby photos, images taken at the same time last year (for nostalgia factor), and all-time favorites; but you can also search by date or time, location, or album name. In iOS 7, the Photos app offered a few basic editing features and filters, but for anything fancy, you needed to download Apple’s iPhoto app. In iOS 8, iPhoto has been retired, and bits and pieces have made their way into the Photos app, offering you all sorts of advanced editing features. Download an image to your device, and you’ll be able to use a bevy of iPhoto-inspired features to crop, straighten, remove red eye, adjust lighting and contrast, and more. By default, the image adjustment tools change your photo on a broad scale. The filters introduced in iOS 7 are here to stay, and though they gain no new counterparts, iOS 8 does introduce a new adjustments control that lets you alter a photo’s light, color, and (if you choose to go the greyscale route) its black and white intensity. Tapping on one of those three options will bring up a thumbnail slider to increase or decrease the option as a whole; however, if you tap the list icon above the thumbnail slider, you can see the individual values being adjusted (for instance, the Color slider controls Saturation, Contrast, and Cast). Tap one of those, and you’ll get a detail slider to adjust those specific values alone. Tap on a specific adjustment in the adjustments list to individually change its value. All these edits sync across your devices, so that the fixed image appears in your library immediately. They’ll also be non-destructive: if you decide you preferred your image unfiltered, you’ll be able to revert it. On top of that, iOS’s new Actions options for developers means that your favorite third-party apps can provide filters and adjustments that you can use from within the Photos app just by tapping the Edit button, then tapping the circle icon with ellipses in it to access the app.